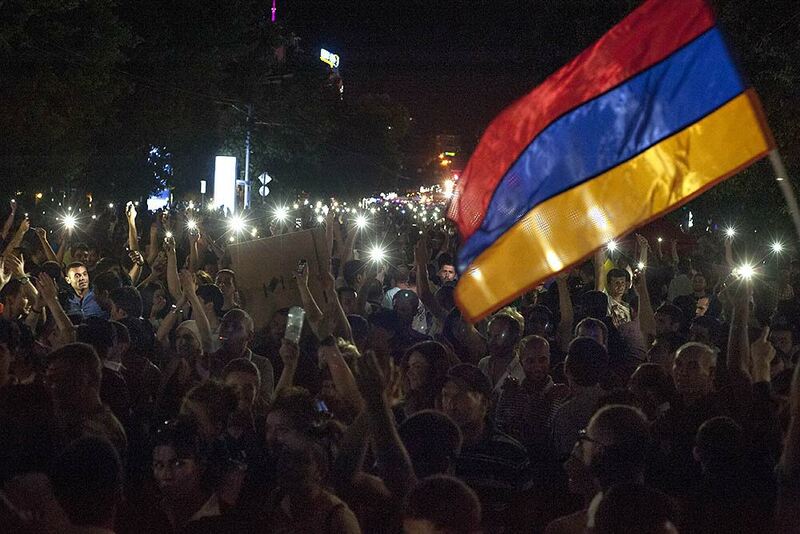 Armenia: Can the Protests Bring Change? There have been both kisses and curses. Three wedding celebrations and a barrage of injuries. At first glance, Armenia’s protests over higher electricity prices might appear just another chapter in this tiny, poverty-stricken South Caucasus country’s long chronicle of street demonstrations. Some analysts argue that, this time around, the event could prove a turning point in bringing serious government reform to Armenia. But, they caution, demonstrators have yet to suggest a game plan for such reform. Now in their tenth day, the protests on capital Yerevan’s downtown Baghramian Avenue, attracting primarily the young, have become “a multi-headed dragon” for President Serzh Sargsyan’s administration, independent analyst Saro Saroian claimed. “[A]fter decapitating one head, another one grows immediately in its place,” he elaborated. That is essentially what happened on June 27 after a group of protesters accepted Sargsyan’s offer that the government would cover a proposed 16-percent increase in electricity prices by the Russian-owned Electric Networks of Armenia (ENA) and have auditors and an intergovernmental Russian-Armenian commission look into alleged financial wrongdoing that protesters claim led to the proposed price hike. Terming the envoys “my dears,” Sargsyan, a former prime minister, defense minister and interior minister who has faced down more than a few protests in his seven years in office, claimed having police bulldoze protesters out of downtown Yerevan “is not our aim.” He urged the group to listen to his “friendly appeals” for a solution to the problem. Rather than forcing protesters off Baghramian on June 28, police, taking their cue from the president, are trying to style themselves as peacemakers. On June 29, a beaming Vladimir Gasparian, head of the Armenian police, enthused that he had seen “bright faces” during a visit with protesters. The night before, Yerevan Deputy Police Chief Valeri Osipian stiffly went on walkabout and chatted with media. The president’s overture essentially split the protest between a few hundred who agreed with the government’s proposal and left Baghramian for nearby Liberty Square, and hundreds more, dissenters, who stayed put. The numbers now favor Baghramian more strongly, but no sign of a definitive leadership has emerged. Unlike the short-lived Barevolution that followed Armenia’s disputed 2013 presidential elections, this is not a fight involving politicians or opposition parties. “This is the result of a civilian struggle over the past two to three years, when thousands of people were mobilized. Not a crowd, but an organized fight, and a national fight, when the citizens know their rights,” commented Saroian. Participants compare themselves with the massive demonstrations of the late 1980s for the rights of the predominantly ethnic Armenian region of Nagorno Karabakh in then Soviet Azerbaijan. That is not an analogy the government would welcome. The Karabakh movement morphed into a powerful independence campaign that led to Armenia’s formal break with the Soviet Union in 1991. One demonstrator, 32-year-old psychologist Anush Badalian, says that early the independence period – the collapse of the economy and energy sector, a brutal war with Azerbaijan over Karabakh – fires protesters’ refusal to back down. “We are the generation … who saw the dark, the cold and the war, who sat at cold school desks, who ate bread received with ration cards … Nothing scares us because we are used to hardships and fights,” Badalian claimed. Ruben Mehrabian, a political analyst at the Armenian Center for National and International Studies in Yerevan, advises caution, however. “At the moment, there is not the power [among the protesters] to serve as an alternative to the current government. But that does not mean that it will not appear in the future,” Mehrabian said. Cooperation for Democracy Center Chairperson Stepan Danielian agreed. The protests may ultimately lead to a big disappointment, he said. As with the Barevolution, protests have mushroomed beyond Yerevan (to the regional towns of Gyumri, Vanadzor, Kapan and Sisian), but not with the numbers in the capital city. While more protesters could prove decisive, “[t]he issue is not only about the protests’ participants,” underlined Danielian. “Public structures and mechanisms to make decisions must be developed,” he said. At its crux, many Armenians believe, lies the government’s perceived tradition of looking out for its business buddies; in this case, ENA’s owner, a Russian firm, Inter RAO UES, close to the Kremlin. Demonstrators are furious over reports, such as one from anti-corruption watchdog Transparency International Armenia, that claimed that 450-million-drams ($952,078) in rental fees for luxury cars contributed to ENA’s government-endorsed demand for an increase in electricity rates. To address that anger, the government has suggested that civil society and the opposition alike have a say in the choice of ENA auditors. And has not excluded the possibility of ENA’s resale or nationalization. But, for some analysts, such tactics do not go far enough. So far, protesters have not clearly outlined what that something else would be. That could prove reassuring to Moscow, which has been closely watching the protests for signs of a repeat of the 2013 Ukrainian revolution. Aside from some individual outbursts, though, protesters deny they are aiming at Russia, Armenia’s closest ally. Moscow’s June 28 decision to allow an Armenian court to try a Russian soldier, Private Valery Permyakov, charged with the murder of a family in the northern town of Gyumri, appeared a bid to defuse demonstrators’ anger, but, if so, it did not appear to work. Demonstrators told EurasiaNet.org the decision only showed them that Moscow understands their power.